When you’re cleaning out the house or having a renovation or remodeling project, you will be faced with tons of debris. To get this out of the way, hire Jux2 Dumpster Rental. We allow you to easily and conveniently get rid of your broken appliances, yard waste, dirty carpets, construction and renovation waste materials, old furniture, and anything else you don’t need in Las Vegas area. Our roll off rentals are easier to load than any other roll-off dumpsters and more affordable. Get rid of the rubble from your house improvement projects. Give us a call to discuss your requirements and get personal assistance during the roll-off dumpster size selection process. So, why not make your roll off rental experience easy and just hire us to save yourself the hassle, time and not to mention the most important part: The Money! What Size Dumpster Should I Get? Our Enterprise roll off rental services are suitable for all types of sites, such as distribution and manufacturing sites, educational facilities, healthcare facilities, construction sites, and much more. Once you choose the dumpster size, confirm with the rental company the dumpster’s weight limit. It is very important to select the correct weight limit since additional charges are added to the overall rental charges. If you do not have a lot of debris or adequate space, a small 10-yard roll off rental is best. This container would be good enough to take away all your garbage and other minor junk materials. These small dumpsters are ideal for some residential debris removal projects; for example, a small home cleanouts or DIY home improvement projects. If your house renovation project involves removal of floor tiles, wooden deck panels, and the disposal of other junk materials, or if you are conducting a full clean-out of your attic, garage, and basement, then our 20 cubic-yard dumpster is the best choice. It can also contain trash from large yard cleanups, floor tiles or decks of about 400 square feet. A 30 to 40 cubic-yard dumpster may be enough to handle the trash and debris resulting from these tasks. You will need our largest dumpster if you decide to clean out your entire office building or undertake a major construction project. Call us today at 702-381-6390 so we can help you find the right dumpster size. What Prices Should I Expect to See for Dumpster Rentals? The location also plays a critical role. For those doing dumpster renting, they are likely to be charged more than those who are having them placed on private property. This is because dumpster renting in Enterprise, including the city if Minneapolis has more stringent rules and regulations and thus costs more to ensure that an individual adheres to them accordingly. The weight and shapes of the junk materials also help determine the cost of our roll off rental. Heavy scrap materials such as huge chunks of concrete will be more difficult to transport and the truck carrying it will consume more fuel. 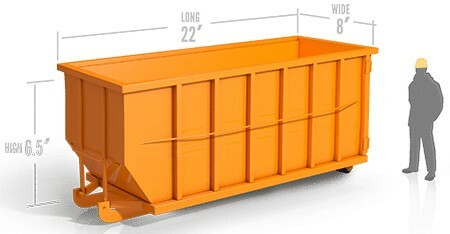 Dumpster rental services need a drop-off and pick up date to calculate the cost. Consequently, knowing the exact duration of your dumpster requirements is best to get a low price on these services. If you have secured the services of a contractor in your home remodeling work, you can find out from him the estimated amount of rubble that your project will produce and the right size of dumpster needed to haul it away. This will help them provide a recommendation on the appropriate sized your situation. It would be best to give our dumpster professionals here at Jux2 Dumpster Rental a call at 702-381-6390 today to learn more about dumpster costs. Besides paying rental fees, you also have to consider county or city landfill fees as well as permits into the total price figure. So, always ask your dumpster renter or trash hauling company about recycling your scrap roofing shingles. Should I Get a Permit for Dumpster Rentals? Once you have on the type of roll off rental service to get from Jux2 Dumpster Rental. We advise all of our customers to contact their local county office in regards to whether or not you need to obtain a permit for your dumpster. There are important guidelines always to remember when renting a dumpster. That’s your private property, and taking hauling off your junk is your private business if the materials you’re disposing of do not include items that have special disposal methods. Some local authorities require you to apply for a permit before you rent a dumpster unit. Most of the time this will only apply if the dumpster is going to be positioned on or near the street, so make sure you have a permit, as failing to acquire a permit can result in hefty fines. When you require a dumpster in Enterprise, give Jux2 Dumpster Rental a call at 702-381-6390. We can provide you with the roll off rentals that will handle any big or small project.